We've been working on making the site take over as smooth as possible but inevitably with these kinds of things there will be complications. In the work required to switch the site content from the company it was hosted with to our own hosting site, we came across a problem in the form of the forum. The forum was hosted (for free - which is probably the source of the issue, it's like a "pay as you go" forum set up) by a company (naming no names) that made things terribly awkward for us. We couldn't swap the forum to our hosting without paying a fee. We couldn't copy the content in bulk and import it (at all). We couldn't import the users (at all). We have paid the fee for the first service but still didn't hear anything. We got in contact with them, email and phone and met with more unhelpfulness. It's a bit of a crushing disappointment for us - we wanted to get the content and users there copied over. Having said that, these kinds of things happen and we're in no way going to hold grudges, whine or moan. We're going to rebuild the forum from scratch. We're looking into that now. And this is when the bad news ends and good news begins - a new forum equals fun things like new features, possibilities and themes and so on. We want to make the forum more of a hub to the site - the comments that you guys give below the blog posts are top notch and that kind of discussion is always better suited to a board structure. We also want to tie in the CE contest with the forum launch - it seems like a good combo! 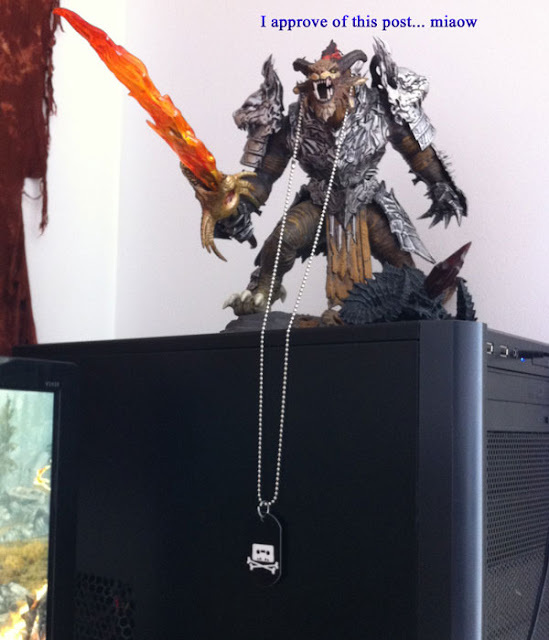 My own CE Rytlock statue is almost nodding in approval from the top of my PC case. He also apologises for the dust.